The Pro Series 20 oz. Ultimate is the heaviest stretched canvas ever from Fredrix, weighing in at 15 oz. raw and 20 oz. primed. This heavy texture canvas with excellent tooth is ideal for heavier paint applications and mixed media. 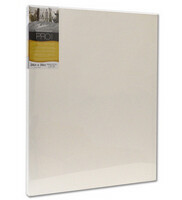 Stretched on kiln dried stretchers bars in gallerywrap and deep styles, the Pro 20 oz. Ultimate features extra bracing for added support. Fredrix Pro Series 20 oz. Ultimate canvases are a versatile option, suitable for oil, acrylic and alkyd paints.